A Bellshill couple convicted of assaulting their young children by smacking them have been placed under the supervision of social workers. The boy and girl, who are both of primary school age, claimed they were punished for not getting good enough grades. 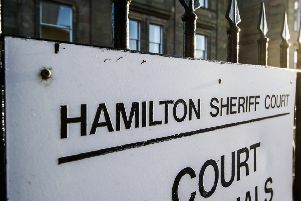 The mum and dad, who are in their 30s, were found guilty of assault after a three-day trial at Hamilton Sheriff Court. Sheriff Shiona Waldron heard the boy and girl were sent to their bedroom and ordered to take off their clothes before being smacked on various occasions in January and February this year. The boy said his mum held him down while his dad smacked him. He said he struggled to breathe and begged his dad not to hit him. Their dad admitted smacking the children “for a variety of reasons”, but insisted it wasn’t for “below average grades”. The couple returned to court today (Monday) for sentence after their conviction last month. Paul Mullen, defending the dad, said his client continues to deny he did anything wrong. The lawyer stated: “He believes that, just as he was chastised, he was chastising the children. However, the court has recognised that this behaviour is criminal. Kevin McCarron, representing the mum, said she, like her husband, has never been in trouble before and has found it very difficult being separated from her children who were taken from her after she was charged. Mr McCarron told the court: “She’s spent much of her life caring for the children and it’s unfortunate to say the least that she finds herself in this position. “Her life has been turned upside down since this matter came to light. Sheriff Waldron said the case had been “distressing” not only for the parents but everyone who had heard the children’s evidence. She was concerned that the dad continued to protest that the smacking was no more than “reasonable chastisement”. She hoped that a period of supervision by social workers would help him realise what he had done was “unacceptable”. The pair were both put under supervision for eight months and Sheriff Waldron acknowledged that at some point the children will be returned to them. She told them: “I have no doubt from the evidence of the children that they were generally well looked after and cared for.